The Atwood Ranch is a private working family ranch. It is not available for rental purposes. It is offered exclusively to donors supporting selected regional non-profits for private celebrations or corporate events. All costs associated with event design, management, and production, including catering, beverages and services, furnishings, equipment, decor, and guest transportation, are separate items, above and beyond the charitable donations made. We are now accepting limited bookings for 2018 CORPORATE and CHARITY events in summer and fall, and for the winter holidays. Please email your request to info@julieatwoodevents.com. We provide a great deal of important information here on the site about the location, restrictions, and selection criteria to ensure a perfect fit and the best possible guest experience. Thank you for spending time to study our website, and for your interest. The Atwood Ranch is a private family ranch, on an historic former winery property dating back to the 1850s. It is situated at the base of the Mayacama Mountains, in the fabled Valley of the Moon, directly across from Jack London’s Beauty Ranch. Its borders include Calabasas Creek and a ridgeline stand of Ponderosa Pines. 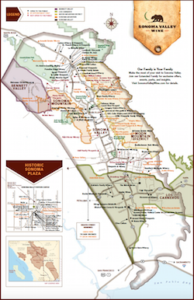 While the majority of the ranch is open space, oak woodlands, horse & cattle pastures, and wild land, there are 20 acres of premium Cabernet Sauvignon vineyard that has achieved certified “Sustainable Sonoma” status. This fruit goes into Sonoma Valley wines from Schug, Laurel Glen, Migration, Brooklyn Winery, and others. The 1908 Arts & Crafts farmhouse overlooks the vineyard, valley, and Sonoma Mountain. There are cozy, delightful and well-lighted spaces in the residence and adjacent conference suite which are made available for a few hours before weddings for relaxing and final primping by couples and small wedding parties. There are no overnight accommodations, but our exclusive planning services include assistance with destination management for clients and their guests. Our clients are sensitive to the quiet rural neighborhood, hosting parties that observe respectful noise controls, and end by 11pm. All guests enjoy the luxury of required shuttles from their hotels, vacation homes, or conveniently arranged park & ride locations. The ranch is about 25 minutes from both downtown Sonoma and Santa Rosa, about 40 minutes from Petaluma, or Napa, and 90 minutes from San Francisco. Visits are by appointment only, and require at least 3 weeks advance reservation. Weekend tours are sometimes available. Contact us for a sample contract and budget information, or to make an appointment. We do not accept wedding bookings more than 12 months in advance. Charitable donations are not “site fees”. All services, equipment, shuttle transportation, dining & beverages, and entertainment are all “a la carte”. Our clients enjoy the attentive and personal services of world-class design, culinary, and management resources, who collaborate to create unique celebrations reflective of their personality and style. The Atwood Ranch in Sonoma Valley is an historic family ranch, dedicated to preserving the agricultural, conservation, and philanthropic heritage of Sonoma County. Julie Atwood Events (JAE) is the exclusive event planning, design, & management resource for the Atwood Ranch. The Vineyard Ranch in Sonoma Valley is available for private social events exclusively as a privilege to donors supporting Bay Area non-profits listed on our website. The Atwood Ranch in Red Bluff, California, is not available for social events. Budget items, restrictions, insurance and other details are described in a sample contract, which we are happy to provide. Clients may purchase & provide wine & spirits. Wines served must be from Sonoma County AVAs. All adult beverage service must be provided by licensed beverage caterer. JAE provides a list of EXCLUSIVE RESOURCES and assists clients in matching resources to their needs and style. There is no guest parking permitted at our Sonoma event venue on the ranch, other than for those guests with an ADA placard. All transportation arrangements with commercial resources can be facilitated and/or coordinated through JAE. Exclusive transportations resources are Pure Luxury Transportation, California Wine Tours, and Bauer’s Intelligent Transportation. All event budget items are separate from charitable donations. While every event is unique and designed specifically for each client, sample budgets are available upon request for a variety of event formats.